Who can resist the search for alien specimens from space? Most meteorites are small pebbles; they drop all over the planet but are most easily detected in deserts, or in fallen clusters. Finding them requires metal detectors, maps, jeeps, software simulations, chemical analysis, airplane tickets, patience and a lot of luck. The practical lore in this slim how-to manual was previously known only by the close-knit club of professional meteor hunters. As far as I can tell, this is the only book on how to find meteorites; even the web doesn’t contain the useful details this guide does. Its 84 color pages discuss the gear, the techniques, and the logical tricks needed to find and excavate a metallic needle in a geographic haystack. 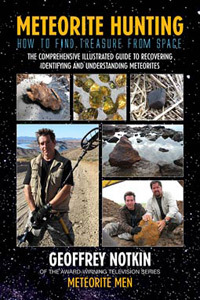 The author is one of the stars of Meteorite Men, a TV series which documents the adventures of he and his buddy as they hunt for meteorites in exotic photogenic locations around the world. While meteorite hunting is rarefied hobby right now, it is becoming increasingly regulated as it gains in popularity. Meteorites fall to the ground everyday, but statistically the ones you find will be ancient – a fossil in fact, like gems. You need to obey the local laws even though space rocks are just sitting on (or below) the ground waiting to be picked up. 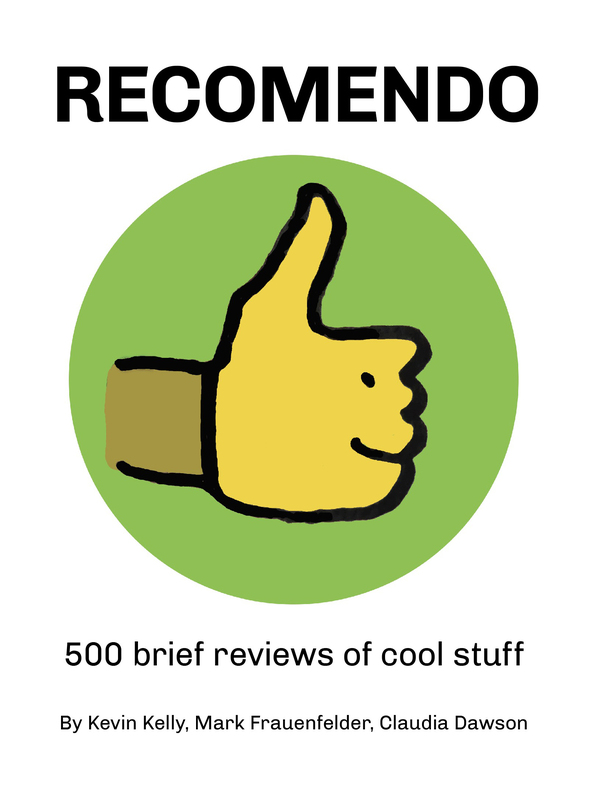 The hard part is still finding them, which this guide will help. If you are going to start hunting for meteorites, the one thing I can guarantee is you are going to find meteorwrongs. Your metal detector can only tell you so much; you need to do the rest. Metal detectors that are used for hunting meteorites are calibrated to return a signal when they find iron. Sophisticated modern hand-held detectors such as the Fisher F75, a personal favorite of mind, have the capability to distinguish between different types of metal. Picking a meteorwrong from the surface is one thing; digging one up from several feet underground is another. It can be tiring and discouraging to spend half an hour toiling through hard ground with a muddy shovel only to reveal a foot of rusty pipe. That is why, when people ask me what you need in order to be a successful meteorite hunter, I say: "Determination." Be prepared to dig up a lot of trash on your way to finding meteorites, especially in areas that have been farmed, mined, or were once settled. A "hot rock" is a terrestrial stone that sets off a metal detector. It is an old gold prospector's phrase that has been adopted by meteorite hunters. Is is very important to remember that there are many different types of earth rocks that contain iron, so if your target turns out to be stone, rather than man-made iron trash, do not automatically assume that it is a meteorite. 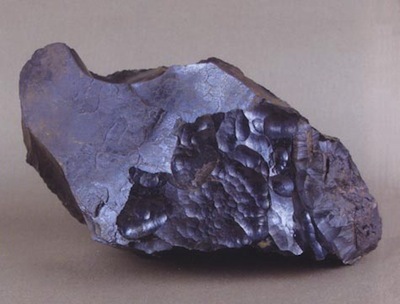 The common terrestrial iron oxide hematite is often mistaken for meteorites b novices. Hematite typically does not show any attraction to a magnet and will usually leave a red streak on a white ceramic tile, while an iron meteorite will leave little or no streak. The surface features on some hematite specimens also have a visual resemblance to regmaglypts. 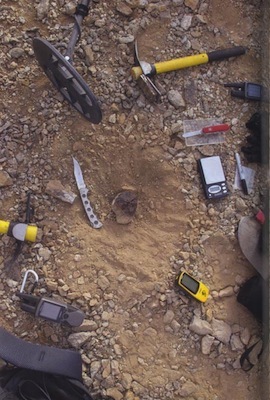 Excavating a complete 870-gram stone meteorite in the Gold Basin strewnfield. While the exposed surfaces had weathered considerably, fusion crust and regmaglypts were present on the buried sections. It turned out to be the best-preserved fusion crust we had ever seen on a Gold Basin specimen. The glowing fireballs we see in the sky are caused by atmospheric pressure and friction, but meteors stop ablating while they are at least seven miles high. If you are lucky enough to witness a bright fireball, and it begins dark flight while approaching you or directly overhead, it is possible that meteorites will land nearby. When a fireball apparently lands in the vicinity what we are usually seeing is it arcing away over the horizon, still high up in the atmosphere. Due to the curvature of the earth, the fireball may seem to hit the ground, but has in fact just moved out of our field of view and gone beyond the horizon. because of their extreme brightness, fireballs can appear -- to our human eyes -- to be much closer than they really are. It is something I, myself, have been fortunate enough to witness a couple of times, which can be frustrating because it does look as if meteorites landed "just over there." If anything made it to the ground, however, it probably landed hundreds of miles away. A new Nevada stone meteorite lying exactly where it was found. 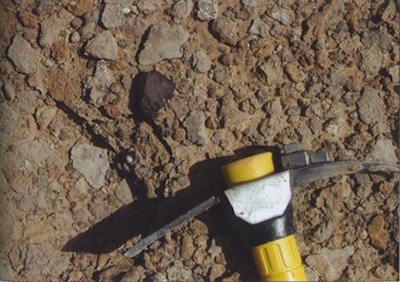 Note the relatively fresh, black fusion crust, indicating a fairly recent fall.